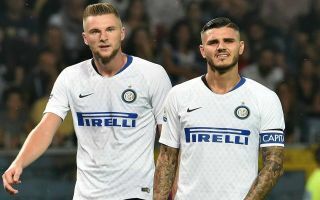 Juventus are reportedly considering Inter ace Milan Skriniar on their list of potential defensive transfer targets this summer. The Bianconeri remain on course for an eighth consecutive Serie A title this season, while their thrilling comeback against Atletico Madrid in midweek kept their Champions League dreams alive. However, a key factor in their continued success has been their constant drive to improve, on and off the pitch, and that looks set to continue this summer. According to Calciomercato, the Turin giants are looking at options to bolster their defence, which is a sensible strategy given the likes of Giorgio Chiellini, Leonardo Bonucci and Andrea Barzagli are well into their 30s. That has led them to consider various targets, but it’s added that Skriniar has now been added to the Juventus shortlist in what would be a shock move on rivals Inter. Whether or not it would be a successful one remains to be seen, as Nerazzurri boss Luciano Spalletti has previously gone on record to say that he believes the Slovakian international is worth well in excess of €100m, as noted by ESPN. With that in mind, time will tell if Juve have the resources required to prise Skriniar away from Inter, with the 24-year-old continuing to play a crucial role for Spalletti this season. He’s made 72 appearances for the club since joining from Sampdoria in 2017, helping Inter qualify for the Champions League this season. It would appear as though they’re struggling to do repeat that feat this time round, and so perhaps a move to Juventus where he could challenge for major honours year in and year out could appeal. Nevertheless, Inter will surely be desperate to avoid losing a key cog in their side, especially to a direct rival like Juventus.